Atlanta. The Porsche motorsport department is presenting Weissach’s latest treat at the Geneva Motor Show: the 2019 911 GT3 RS with a race-bred chassis and a high-revving four-liter, naturally aspirated engine producing 520 horsepower and 346 lb.-ft. of torque. Based on the 911 GT3, the RS has been refined even further, combining the most powerful naturally aspirated engine ever fitted to a road-legal 911 with a suspension that features recalibrated rear axle steering tuned for maximum dynamics and precision. The new 911 GT3 RS accelerates from 0 to 60 mph in 3.0 seconds, which is 0.2 seconds quicker than the current 911 GT3 with PDK and 0.1 seconds quicker than the previous 911 GT3 RS. Top track speed of the 2019 911 GT3 RS is 193 mph. Following the launch of the 2018 911 GT3 and the 2018 911 GT2 RS, the new 911 GT3 RS represents the third road-legal GT model to be unveiled within a year. Aerodynamics and lightweight construction have determined the design of the wide, weight-optimized body with its classic fixed rear wing. Like on the 2018 911 GT3, the front and rear fascia are made of lightweight polyurethane. Additionally, the front trunk lid and fenders on the 911 GT3 RS are made of carbon fiber and the roof consists of magnesium. Like on the 2018 911 GT2 RS, NACA ducts in the front trunk lid optimize brake cooling without increasing drag. The front fascia features a spoiler lip that is larger than on the previous model, increasing downforce in conjunction with the larger side skirts. At the rear, the large wing mounted on the carbon fiber deck lid works in combination with a rear underbody diffusor. The result: The 2019 911 GT3 RS produces more than twice as much downforce as the regular 911 GT3 at 124 mph. The race-inspired appearance continues in the interior: Full Bucket Seats with carbon fiber reinforced backrests provide a high degree of lateral support to suit the vehicle’s exceptional level of lateral grip. Lightweight glass for the rear window and rear side windows, lightweight door panels with door opening loops, reduced sound insulation, and the omission of rear seats emphasize the consistency of the material choices and the dedication to saving weight. The Alcantara steering wheel measuring 360 mm in diameter features a yellow 12 o’clock center marker. The four-liter, naturally aspirated flat-six engine from Porsche in the new 911 GT3 RS pushes the sports car to new limits: It delivers 20 horsepower more than the engine in the 2016 911 GT3 RS and the current 911 GT3. Plasma coated cylinder liners, a central oil supply through the crankshaft with larger bearing diameters, larger connecting rod bearings and the rigid valve train with shims to provide valve clearance compensation all carry over from the 2018 911 GT3. Capable of up to 9,000 rpm like the regular 911 GT3, the thoroughbred engine takes in ram air through openings in the rear quarter panels, and it is closely related to the unit used in current Porsche 911 race cars. The unmistakable flat-six sound escapes the exhaust tips, which are made of titanium like the muffler itself. 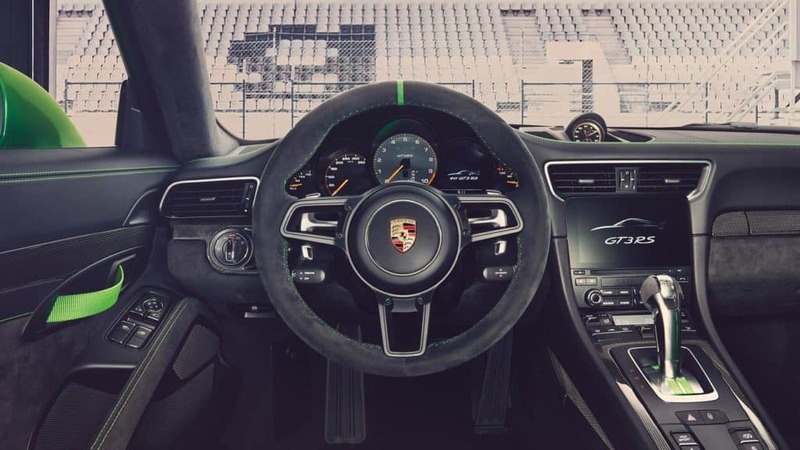 The engine is mated to a specifically tuned seven-speed PDK, which features performance-oriented gearing with the top track speed being reached in seventh gear, like all GT tuned PDK transmissions. Technology derived from motorsport ensures that the chassis offers exceptional driving dynamics. Porsche Active Suspension Management (PASM), active engine mounts, rear axle steering, and the fully variable electronic locking rear differential with Porsche Torque Vectoring Plus (PTV+) are standard. Ball joints on all suspension links provide even greater precision than conventional bearings with rubber bushings. Furthermore, the new 911 GT3 RS features new helper springs at the front axle, in addition to the rear. As is customary for a Porsche GT model, the ride height, toe, camber, caster and sway bar settings of the suspension can be adjusted to suit individual driver preferences. Forged lightweight wheels measuring 9.5 x 20 inches in diameter with newly developed 265/35 ultra-high performance (UHP) tires enhance agility and steering precision, while 12.5 x 21 inch wheels with 325/30 UHP tires mounted at the rear deliver excellent traction. Overall, the wider tires offer a significantly larger contact patch than those of the regular 911 GT3. Large cross-drilled grey cast iron rotors measuring 380 mm front and rear are standard, while the Porsche Ceramic Composite Brake system with 410 mm rotors at the front and 390 mm rotors at the rear can be ordered as an option. The ceramic rotors weigh around 50 percent less than the cast-iron variants. For particularly spirited drivers, the Porsche motorsport department has created an optional Weissach package to reduce the weight of the car even further. With this package, the front and rear sway bars and coupling rods, vehicle roof, steering wheel trim, and shift paddles on the steering wheel are all made of carbon fiber, reducing the weight by roughly 13 pounds. Optional forged magnesium wheels, weighing around 25 pounds less than the standard wheels, are available as well in conjunction with the Weissach package. When equipped with these options, the weight of the 911 GT3 RS drops to 3,153 pounds. The new 2019 911 GT3 RS is available to order now and is expected to reach U.S. dealers in fall 2018. The MSRP is $187,500, not including available options or the $1,050 delivery, processing and handling fee. The Weissach Package is available for $18,000. The magnesium wheels can be ordered for an additional $13,000 in conjunction with the Weissach Package and will be available at a later date. Established in 1984, Porsche Cars North America, Inc. (PCNA) is the exclusive U.S. importer of Porsche 911, 718 Boxster and 718 Cayman; Macan and Cayenne; and Panamera. Headquartered in Atlanta, Georgia since 1998, PCNA is also home to the first Porsche Experience Center in North America featuring a module-based 1.6 mile driver development track, business center, and fine dining restaurant, 356. The company operates a second Porsche Experience Center near Los Angeles. That 53-acre complex features a driver development track with eight educational modules totaling 4.1 miles, a business center, and Restaurant 917. PCNA employs over 300 people who provide parts, service, marketing, and training for 189 dealers. They, in turn, work to provide Porsche customers with a best-in-class experience that is in keeping with the Porsche brand’s 70-year history of leadership in the advancement of vehicle performance, safety, and efficiency. PCNA is an indirect wholly-owned subsidiary of Porsche AG, which is headquartered in Stuttgart, Germany. At the core of this success is Porsche’s proud racing heritage that boasts some 30,000-plus motorsport wins to date. 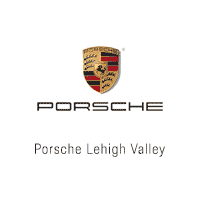 Porsche Lehigh Valley	40.551502, -75.4913828.